Even better, the Dot is available at only a fraction of the Echo's price. We’re referring to Amazon‘s (NASDAQ:AMZN) breakthrough products, of course — the Amazon Echo and the Echo Dot. Amazon Echo is technically a hands-free voice-activated speaker that’s powered by Amazon’s digital assistant Alexa. To call it as simply a speaker will be far from being appropriate, though, because it does so much more than just blare out your favorite music. It can answer your questions, make calls and send messages for you, check weather and traffic updates, read audiobooks, read the news, provide sports updates, turn your smart home appliances off and on, buy items on Amazon, request an Uber ride, and even order pizza from Domino’s for you. And even though it can already do so many things, the device just keeps adding more and more skills to make itself even more useful than it already is. It goes without saying, that having an Echo can make things easier for you at home. Unfortunately, not everyone can spare $179.99 to enjoy that kind of convenience. 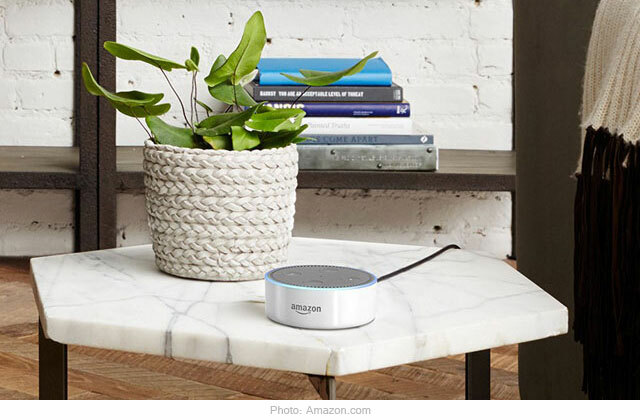 It’s a good thing there’s a mini-version of the Echo — the Echo Dot. In fact, there are those who say that getting an Echo Dot, or maybe a number of Echo Dots, is even better than getting a single Echo. And the reasons aren’t hard to understand. To begin with, the Echo Dot can be yours for only $49.99. And on special occasions like Prime Day, Black Friday or Cyber Monday, the price can drop to as low as $35.00. If you do the math, even at its regular price, it’s easy to see that you can have 3 Echo Dots for the price of just one Echo. Second, the Dot is not as intrusive as the Echo. That’s not to say we think the Echo is an unsightly piece of equipment that can negatively impact the appearance of your home. On the contrary, it is a technological piece of art if you will. All we’re saying is that because of the Dot’s smaller size, it’s simply easier to place it anywhere, without having to move anything to accommodate it. Third, although the Dot’s internal speaker is not nearly powerful enough to provide the volume and quality of sound that you would want, it makes up for this weakness brilliantly as it can connect to your speakers or headphones via cable or Bluetooth. That means if you have another great speaker to begin with, all you need to do is connect your Echo Dot to it and you’ll instantly have the sound quality you want. Last but not least, the Echo Dot can do everything the Echo does. If that isn’t enough to convince anyone who’s been thinking of getting a smart speaker but has been hesitant to do so because of the price, well, humoristically speaking of course, we don’t know what will.